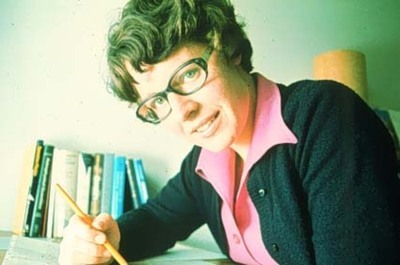 Dame (Susan) Jocelyn Bell Burnell (1943-) is a graduate of the University who has been widely honoured for her discovery of radio pulsars. She was born in Belfast and after attending Lurgan College and later the Mount School in York, she began her studies for a BSc at the University of Glasgow. She graduated with Honours in Physics in 1965. She completed a Ph.D. at the University of Cambridge in 1969. Her thesis supervisor, Antony Hewish, was later awarded a Nobel Prize for Physics for his role in the discovery, although controversially she was not a co-recipient. In 1997 Glasgow gave her an Honorary DSc in recognition of her achievements. She was awarded a CBE in 1999. In 2007 she was made a Dame of the British Empire which was reported in press as "going some way to righting one of the most notorious wrongs in science." She is also a Fellow of the Royal Society and a Foreign Member of the US National Academy of Sciences.She served as President of the Institute of Physics 2008-10.